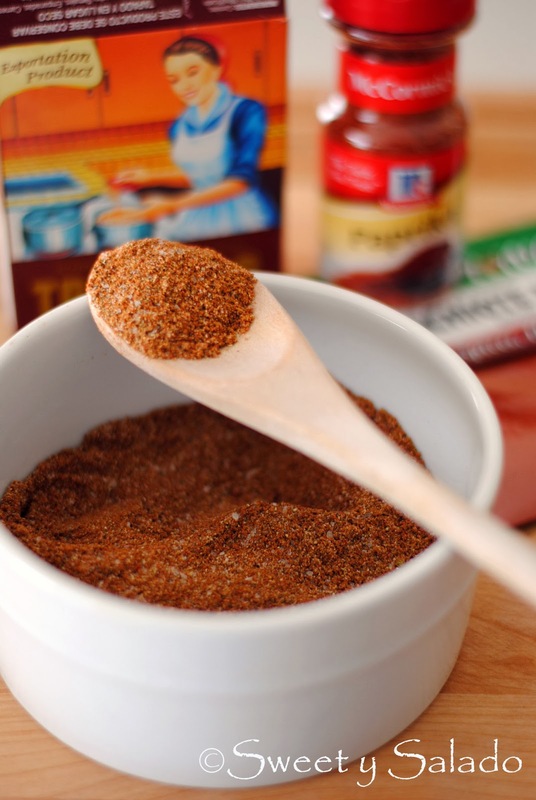 Open the spice cabinet of any Colombian kitchen and the one ingredient you will most likely find besides salt is “Triguisar” which is an all-purpose powedered seasoning made with cumin, annatto, turmeric, garlic powder, corn starch and rice starch. Most people use this as their go to ingredient for lots of Colombian dishes like arroz con pollo, chicken stew, empanadas, tamales and many more. Nowadays, you can buy Triguisar in some Latin stores here in the US, in some European countries and even online but many people are not able to find it and the recipe below will come in handy for them because it’s a very close match to the real thing. The other reason I wanted to post this recipe is because I love to cook with Sazón Goya packets, either the ones with ground annatto or saffron, because they give my recipes a fantastic flavor. The one ingredient it does contain is MSG which is a food additive that is used to enhance flavor, the moment it hits your tastebuds it sends a message to your brain that whatever it is you’re eating is amazing. However, many people consider it unhealthy and unnecessary and prefer not to use it. I personally don’t see anything wrong with MSG as long as you use it in moderation just like you would use regular table salt but if you prefer not to use it the recipe below will be a great substitute for the Sazón packets. The first thing I did was write down all of the ingredients that the Triguisar and the Sazón packets had and then mixed them together to see what I would get but I felt that there was something missing. 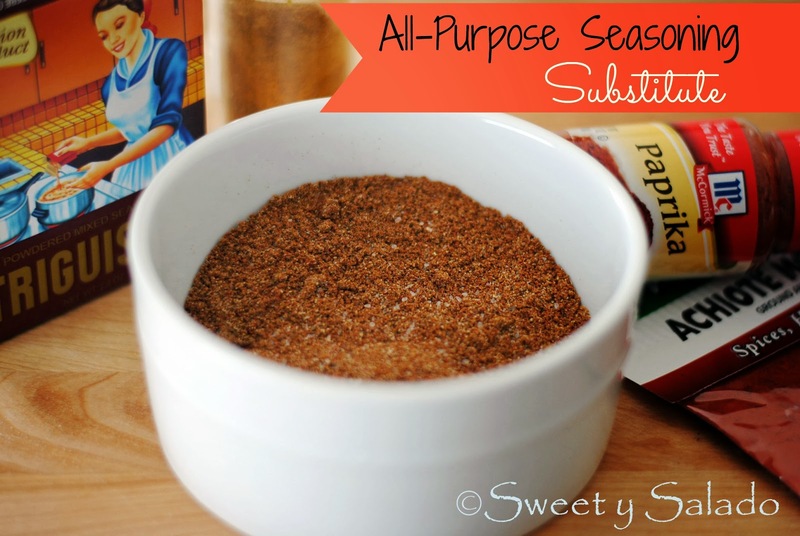 So, my next move was to try to find a recipe online that really made sense, something that had been written by someone who knew what this type of all-purpose seasoning was used for. I found the recipe below in a Chow discussion board and it is pretty amazing, specially because it does what it’s supposed to do, add flavor and color to any recipe. The final result does come out a bit darker but that’s only because the annatto powder I used is pretty dark, so if all you need it for is color, just use a pinch of it and you’re set. Also, if you can’t find annatto, you can easily substitute it with paprika. 1. Mix all ingredients in a small bowl and store in an spice jar or air tight container. Use 1½ tsp to substitute 1 Sazón Goya packet. ** Note: If you can’t find these ingredients in powdered form, you can buy them whole and blend them in a food processor. Adapted from Chow Discussion Board. I'm following a recipe for Cuchoco de Trigo and it calls for "condimento completo" – would this recipe work? Thanks for posting! Yes, it would definitely work. The "condimento completo" we usually use in Colombia is called Triguisar and it has a very yellow color, almost orange, so for that you can use turmeric. It's also seasoned with garlic powder, onion powder, and cumin, so if you combine them all, you'll end up with a very good substitute for Triguisar. I will have to try this, do you have any more? Rossy from L.A.